The Bednarik Award is presented by the Maxwell Football Club and given to the College Defensive Player of the Year. Like the Maxwell Award honoring the nation’s top college player, the Bednarik Award is voted on by sportscasters, sportswriters, NCAA head coaches, athletic administrators and also the membership of the Maxwell Football Club. All to often the skill position players on the offensive side of the ball get the notoriety and fame. More often than not however, games are won are won and lost on defense. Taking a look at the standout defenders in NCAA Football, here’s how the landscape for the College Defensive Player of the Year shakes out after nine weeks of play. 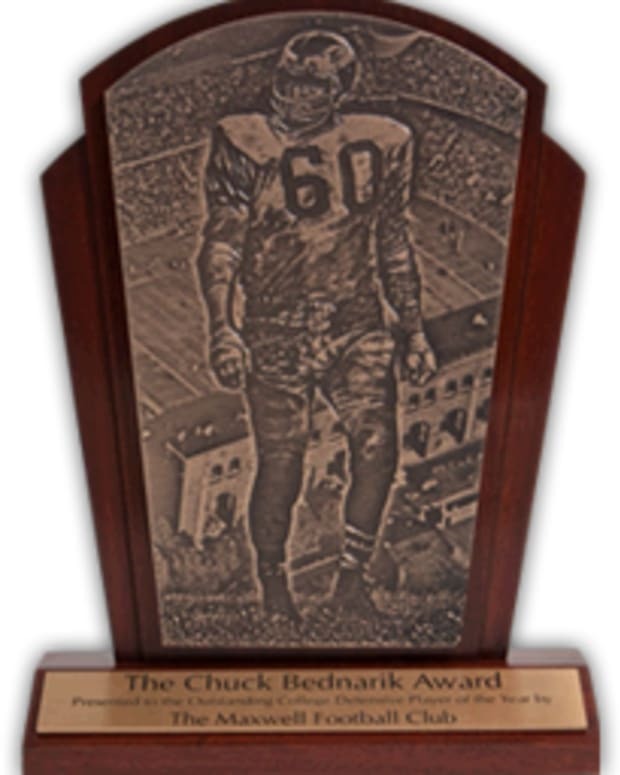 On November 21st, Maxwell Football Club President, Ron Jaworski, announced the 2011 finalists for the 17th Chuck Bednarik Award for the Outstanding Defensive Player of the Year. The finalists are Alabama Junior linebacker Dont’a Hightower, LSU Sophomore cornerback Tyrann Mathieu, and Penn State Senior defensive tackle Devon Still. Here’s how we see them finishing.